Get ready to get drenched! The much-awaited Thai New Year festival Songkran is just a few weeks away. If you’re travelling around Thailand during that time then this blog post is a must-read in preparation for all the fun you’re about to have as well as to know more about the cultural aspects of this auspicious time of year for Thai locals. 1. Songkran (pronounced “Sonk-kraan”) is the Thai New Year festival celebrated from 13 to 15 April every year. It is the country’s most important public holiday. 2. The word ‘Songkran’ is derived from the Sanskrit word ‘samkranti’, which means ‘astrological passage’. 3. Songkran is a Buddhist festival and celebrated in other parts of Asia including Laos, Vietnam, Cambodia and China. Each country has its own unique rituals and celebrations. 4. Water holds a lot of significance during Songkran; it is a vital part of all the rituals and celebrations. 5. 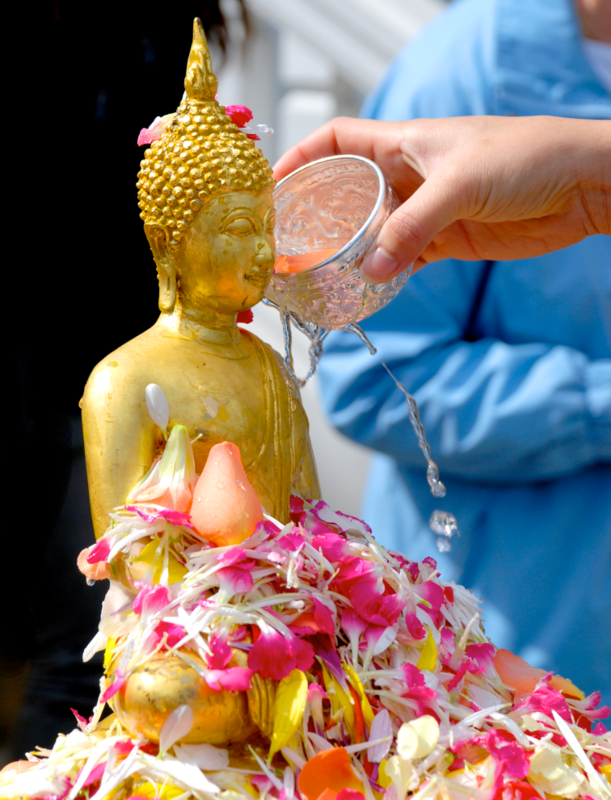 Many Thais will cleanse their Buddha icons and statues with fragrant water; this cleansing ritual is to wash away the bad luck of the past year and to bring luck and prosperity for the New Year. 6. An extension of this cleansing ritual is seen during Songkran celebrations when you’ll see locals splashing water on each other and strangers. This signifies the washing away of the bad luck of the past year and starting the New Year with a fresh, clean slate. 7. Songkran also marks the end of the dry season and the beginning of the rains and holds a lot of importance for the country’s agriculture industry. 9. The ritual of tying white strings to one another’s wrists is an expression of good wishes. While tying the string, the person will recite a short prayer of blessing directly for the individual. These are often left on until they fall off on their own. If someone offers to tie a string on you, be sure to offer your arm with the underside of your wrist facing upwards. 10. If you happen to be in Thailand during Songkran, be ready to get drenched! Connect and keep in touch with Amari on Facebook, Twitter, Instagram & Google+ for exciting updates on destinations, hotel offers and more.